Rory, very nice fix with the tape method! I feel your pain! Your experience illustrates why so many of us are so conservative with the paints we use. Some paints work better than others, and once we "learn" a particular paint range there are fewer nasty surprises! Anyway, yours was a workmanlike and effective fix with that awful paint issue. Very nice! Great paint rescue! Lookin' good! That's some fantastic detailing on the anchor windlasses & brake handles. 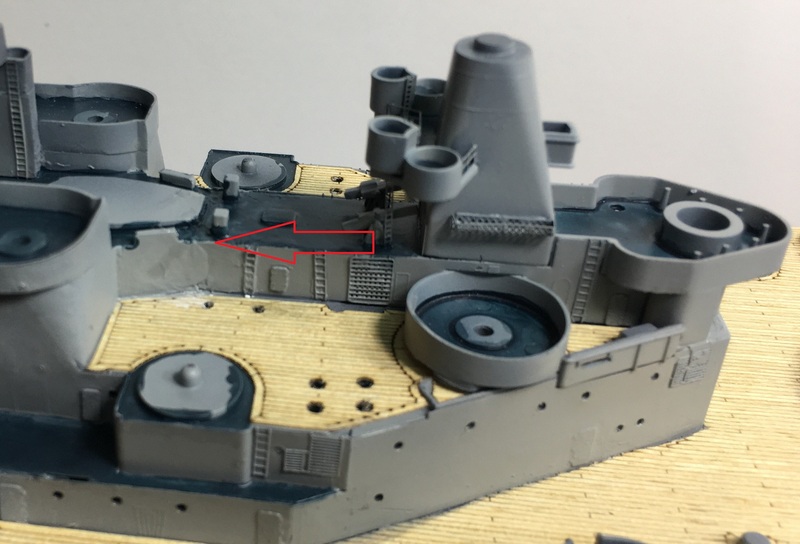 I have fixed my issues with both paint and the rear conning tower mess. Paint wise I found Mission Models Haze Grey to be a very close match and it behaves so well. It went down beautifully. Granted its tape that has been sealed with CA on the edges and impregnated with pledge but still tape. And it looks pretty good if I do say so myself. With the new MM Haze Grey. Great job on the Anchor gear, the f'o'c's'le looks nice and busy. Pity about the dodgy paint, appreciate the heads up, looks like I will steer clear of that. I wouldn't be too worried about a mismatch in colour, paint on ships tend to weather slighty differently depending on how exposed it is, how much funnel smoke drifts over it etc. Anchor chains are on and looking good. I am pleased with them. I also am pretty happy with the various bits and bots that go around the anchor capstans. Plimsoll lines and ship number are on. These were dry transfers and the first time I have managed to use dry transfers and get them right. Turns out that patients, time and many youtube tutorials were the answer. Rear conning tower came out looking pretty good. I am happy with it. Just need to fix the paint a bit. In my infinite wisdom I decided that drilling the portholes would make the ship look much better. All well and good you say except for the fact I had already painted the superstructure etc. Queue up a couple of hours spent with a very careful handled dremel with a long drill bit and we have port holes. I am pretty happy with how it came out. I have also decided (again, after the fact) to put in the support poles for the balcony bits as indicated by the arrow. These are not in the exact correct spot but that's the price you pay for not thinking ahead. I will be adding more on the other balconies when I get some more plastic rod. The rear housing which holds the rear conning tower broke away after painting. This tore off the putty and paint and left a nasty mess. 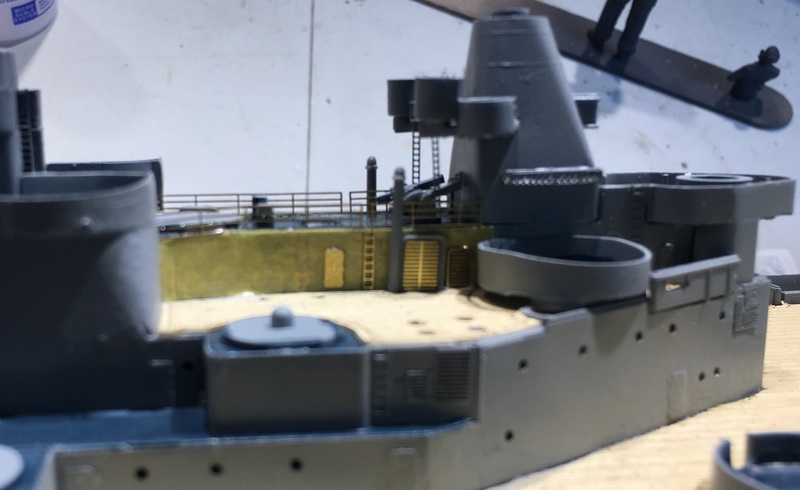 Unfortunately because of where it is and the fact I had already put on the conning tower with its fragile PE as well as the wooden deck I am having a hell of a time getting in there to sand and smooth. I have already damaged the adjacent PE ladders which I am going to have to replace.I think I have come up with a solution which, if it works, I will document later. And lastly, I mentioned this in a previous post but the paint I am using is horrible. Its AK interactive Haze Grey and is simply the worst paint I have ever used. I am forced to use it for now since I have not been able to match it to another paint but after this build or if I find something even remotely comparably its into the trash with it. I use Testor's Haze grey enamel paint. Love how it cover and much more durable than Acrylic paints. Massive progress Rory! Looks Great! Removed by original poster on 02/11/19 - 19:17:05 (GMT). Does anyone have any suggestions for an alternate Haze Grey 5H? I am thinking of trying Mission Models (103). I am using the one from the AK Interactive USN set and its awful. The coverage is terrible on it because its so thin (to start) but it thickens up very fast in the brush clogging it up. I have really struggled with it which is annoying because the Deck blue from the same set has worked wonderfully. I would also not recommend brush painting with either even though it says it can. *edit* Before anyone asks I have tried thinning it as well as at various psi levels (15-22psi. Doing some research online it does seem like AK interactive is pretty hit and miss. I am also going to do a color test with Vallejo 905 which I have seen as a suggestion for Haze grey online. Two thumbs up on the hull painting & the wooden deck! Looks fantastic! Worked on the deck some today. Painted the Deck Blue and tidied up the Haze Grey. Also put on the wooden deck. I was really happy with it. I would definitely recommend spending the extra money and getting a Pontos deck. It fit perfectly! First update in a while. I have finally had some mojo return for this build. 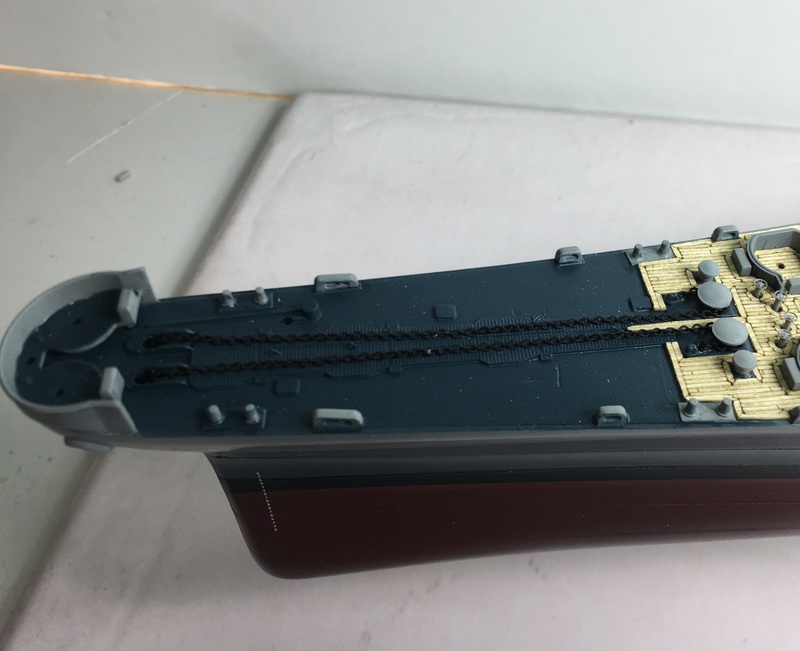 Tidied up some of the superstructure and threw some paint the hull and superstructure. This was easily the hardest hull I have had the dubious pleasure to mask and paint. Its just so long that getting everything lined up and even was a pain. Took me 3 days to get it done to my satisfaction. I also ended up pulling off the tape I was using to try emulate plating. Just didn't look right. I did however leave the furrows in the primer they left and it looks better. Could not get a good shot of this due to the size of the hull. Eventually had to hold her at full arms length to get her all in. I am very happy with how the bow turned out. 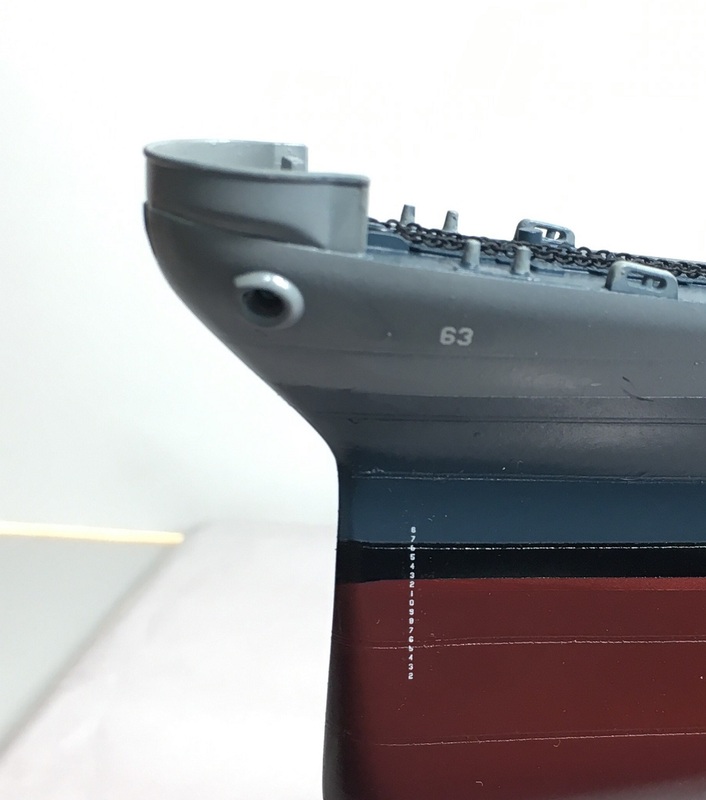 Curve of the hull gives the illusion that the line is curving down but the Navy Blue 5N is the same height above the boot along the whole length of the ship. Thanks so much, Rory! Very happy to hear you are happy with the parts! I can print for others, no minimum. Rory, very happy for you! Wow! Stephen, now that's commitment! New designs coming! I think you'll be even happier. New Main Battery and Fire Control directors ordered! Now if I could make a request about possible future items for the store? What about blast bags for the various caliber guns. I have looked online and I can only seem to find them with other stuff i.e. The lion Roar set which has resin bags and turned guns along with PE @ $150+. I do however see tons of suppliers of just the gun barrels. Oh yes, Rory! You can't beat resin parts! Stephen, who do you use for your printed resin parts? I've found a site here in Australia, but they have a minimum spend making it painful to say the least. I received the parts today and all I can say is Holy Cow, what a difference. The resin is smooth and perfectly formed. No striations at all. All the detail is very well defined and clearly visible. In fact my only concern is I think the detail may be too 'To Scale' as I worry the paint will cover up some of that gorgeous detail. It sounds and looks like a massive improvement in quality. I am looking forward to seeing the difference and I can say that just by looking at the pictures on your website that I will most likely be ordering new Main Battery and Fire Control directors to replace the ones from Shapeways. 3D Printing is the way of the future fellow modelers! 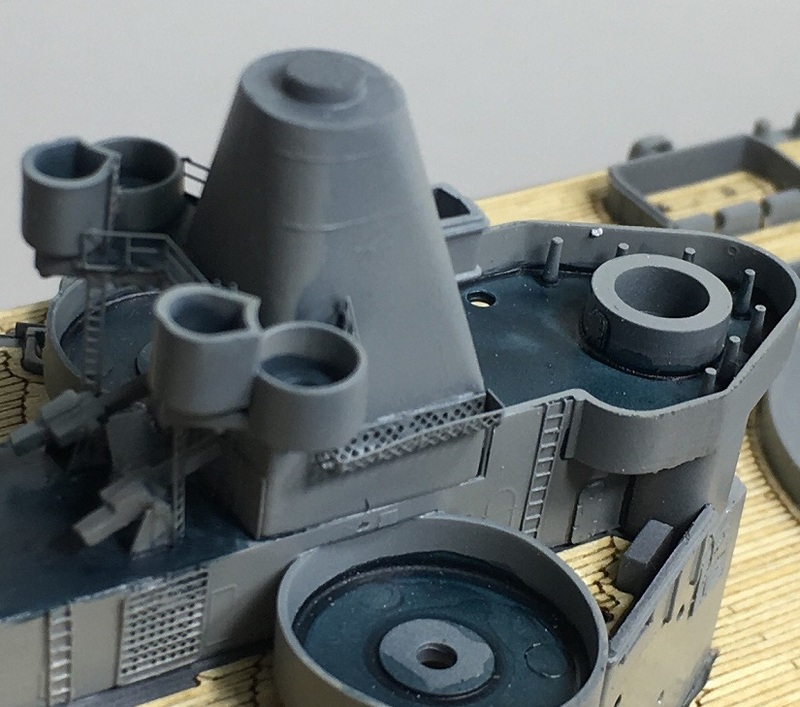 Yes, 3D-printed gray resin is a very good material for scale modeling. IMO, it is better than some other 3D-printed materials, including nylon and white acrylic. I think the new mounts will be an attractive alternative for Rory's model. Shapeways offers several different materials, nylon being one of them. Shapeways calls their 3D-printed nylon "Versatile Natural Plastic". The products that Rory ordered are printed in a different material. His are printed in acrylic plastic which Shapeways calls "Fine Detail Plastic", formerly called "Frosted Detail Plastic". Shapeways does not offer gray resin, not yet anyway. Each of these materials has advantages and disadvantages. Nylon, as you experienced, is difficult to finish because fewer kinds of paint will adhere to it. But many large scale modelers like nylon for RC purposes because of its strength. Google "primer for nylon" and "paint for nylon" to find paints that will work with it. White acrylic, the material in which Rory's current 3D parts are printed, is smoother than nylon, captures fine detail better, and accepts acrylic hobby paints. But white acrylic requires a lot of preparation. Not only does the surface roughness often require further smoothing, the model has to be "post-cured". 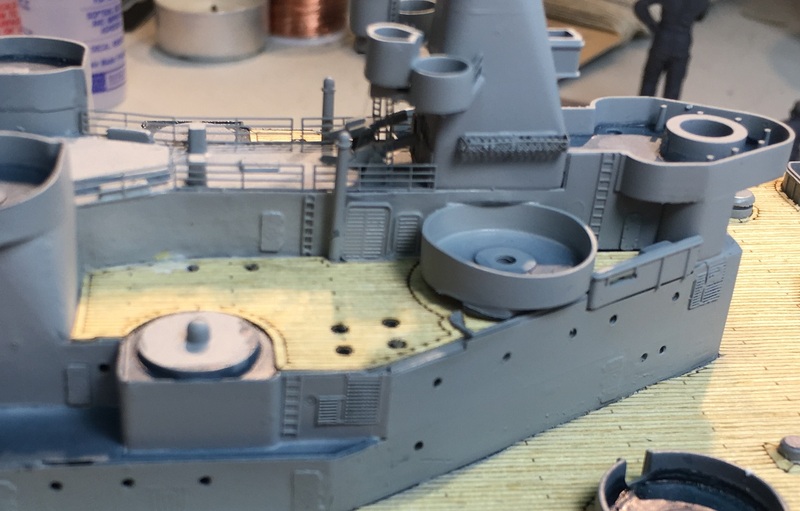 "Post curing" involves exposing the model to sunlight or another UV light source for an hour or so to make sure all the acrylic has fully cured before painting. If any uncured resin is present, the uncured resin can prevent enamel paint from hardening on it. When the white acrylic model is being printed, a waxy material is also extruded by the 3D printer simultaneously with the acrylic to support overhanging features. Although Shapeways melts away the wax in a low-temperature oven before the model is shipped, some wax may remain. Any waxy residue has to be cleaned away by the modeler, not easy or pleasant. When the hot wax comes into contact with the acrylic during printing, the surface there will be rougher because the wax deforms slightly as it begins to support the overhanging feature. And 3D-printed acrylic, which is chemically related to Plexiglas, is expensive. - surfaces are dramatically smoother than the other materials. - uses no wax or other mold-release agent. - accepts enamels (Colourcoats, etc. ), acrylic and metal (Alclad2) hobby paints and Molotow paint marker paint without the need for primer. - gray resin is less expensive than white acrylic. Instead of wax, the gray resin printer creates physical supports that look like sprues to uphold overhanging features during printing. Models like turrets and fire control directors are good subjects for this new material. 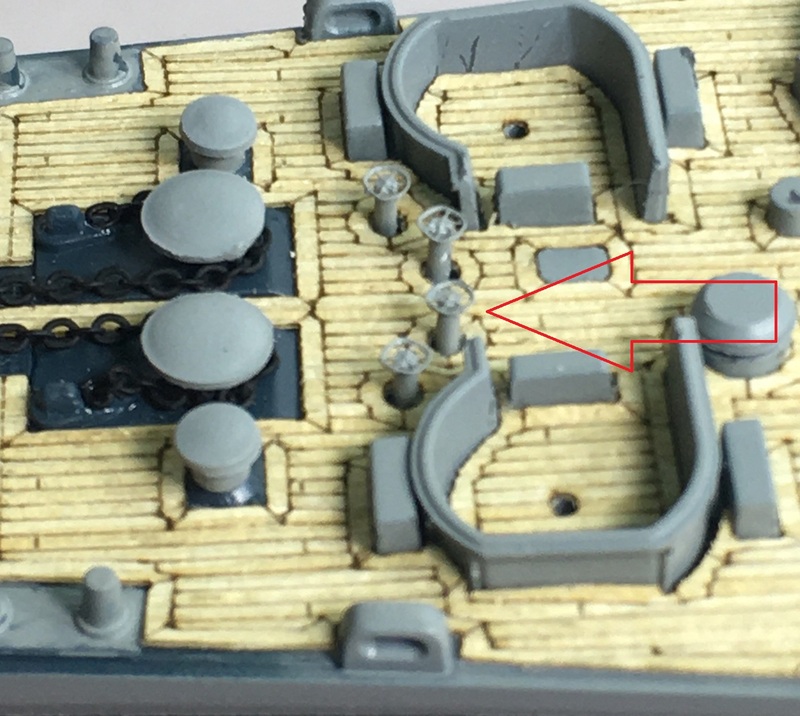 Their boxy geometry means that the supporting sprues can go on the bottom of the model where their contact points are normally hidden. For larger models, they can be found on the inside where their contact points are generally hidden, too. A common cuticle clipper is a handy tool to easily remove them. I'm excited to see what Rory thinks of the new gray resin material compared to the white acrylic mounts he has. Both the mounts he has and the mounts coming are printed from the same 3D design. So the big difference is only the material. I'm the designer of the 3D-printed acrylic parts you ordered from Shapeways. Thanks! I am happy to announce that most of my designs are now available in a new 3D-printed material, gray resin, which offers dramatically smoother surfaces, no waxy material cleanup, accepts acrylic and enamel hobby paints without the need for primer, and is less expensive. Steve, it's great to see parts beginning to be offered in resin as opposed to shapeway's nylon, which is very difficult to paint IMHO! Great decision! Looking forward to seeing what you can do with them Rory!